Navigation: Home » Investing » How Early Could You Have Called an Overbought Stock Market? How Early Could You Have Called an Overbought Stock Market? Have you ever tried to call a market peak? If so, have you tried to trade on it? Assuming you were too early, were you able to stick to your call through market losses and commentary reminding you about how you were wrong? Whew, that’s a lot of thinking. Let’s dig into it… let’s say you made a “too early” call in the past – how early could you have been, while still being proven right, eventually? Can you eyeball how early you can call a market peak? You probably have a bit of déjà vu seeing the above chart if you’ve followed us for a while – but even if you just look at a typical S&P 500 chart, you recognize the above. 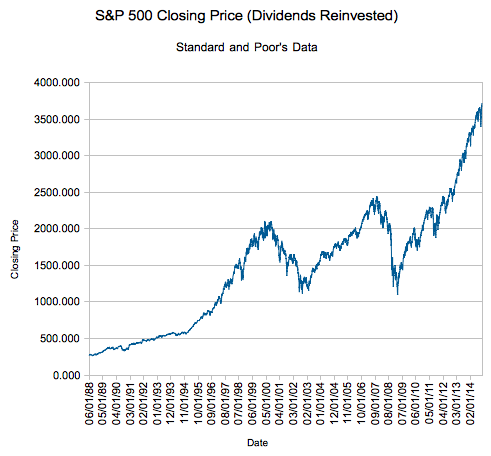 While we normally adjust the above for inflation, that’s invalid for this article – what we’re showing is returns if you brave every storm and merely plow every dividend you get from the S&P 500 back into the S&P 500. (We have a calculator which allows you to do this back to 1871 with monthly resolution, and we have one for the Wilshire 5000 as well). My point – it was theoretically possible, however improbable, that if you made a call on 5/09/1997 you would have been vindicated almost 12 years later. Same for 5/22/1997’s bears being vindicated 5 years later. Now, this theoretical discussion doesn’t take into account actually buying the exact bottom years later, but it does show that while it’s easy to ‘claim’ you are a contrarian, actually playing the part is much harder. You may need to sit on your hands for years at a time… all along taking the abuse from bullish market participants. Even though yours truly has been known to make similar prognostications (that series of articles predated my cash movements by only a few months), as I mentioned earlier I don’t have the stomach required to be a full contrarian – just roughly a 35% one. Which, I recognize, is more than many are – or even should be (look at the respectable return implied in the chart above – just keep plowing your dividends back in to hit similar marks). If you try to call a market peak, good luck sitting on your hands. Do you consider yourself a contrarian? What is your current opinion of the market’s valuation? Is it worth the possible stomach ulcers to invest in this way? Have you ever tried to call a market peak?